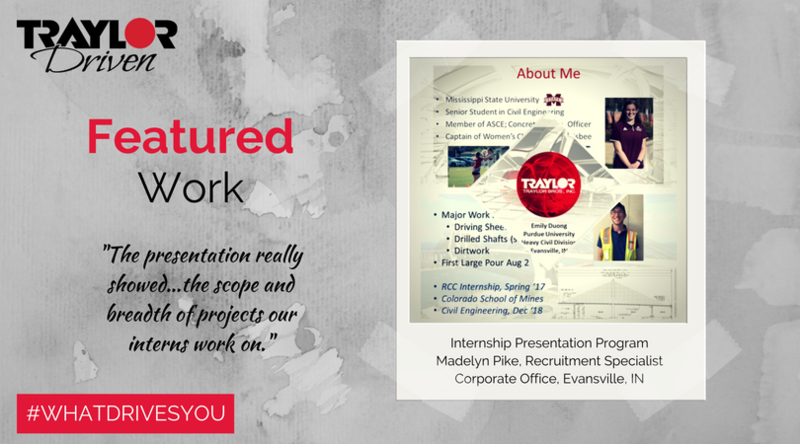 Traylor Driven Featured Work: Internship Presentation Program - Traylor Bros., Inc.
Our August Featured Work highlights two of our nominated work products—one from the office and one from the field. First up is the Internship Presentation Program, conceived of and developed by Madelyn Pike, Recruitment Specialist in our Evansville Office. 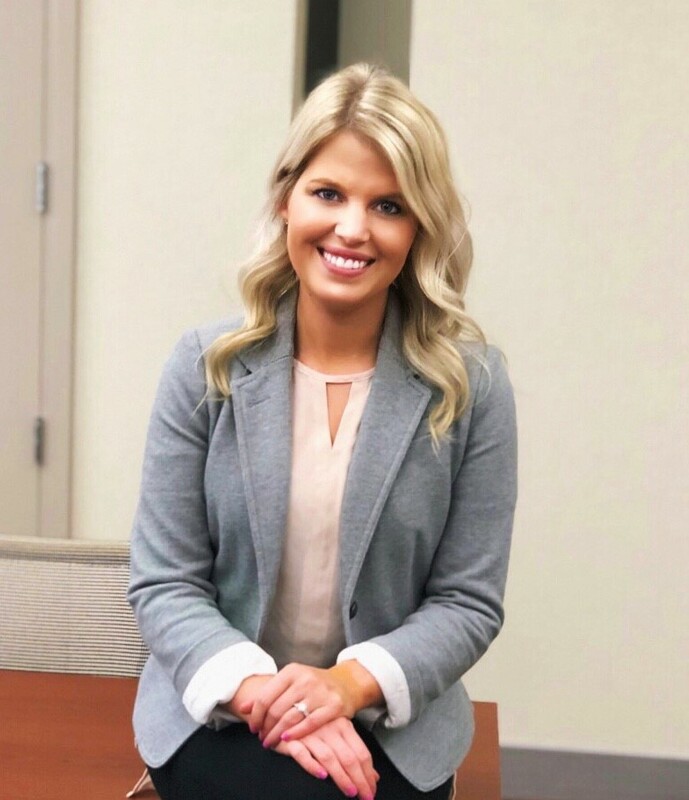 While Traylor has a history of taking on interns from across the country on job sites and in our offices nationwide, until just this month there was no way for most of our team members to know exactly what the interns are up to during their time with Traylor. The idea was for interns to have an opportunity to give presentations about their work to anyone in the company who would be interested. Each intern was asked to prepare a five- to ten-minute presentation that was held in our offices and broadcast over web share to all of Traylor. The result of the successful program was to demonstrate the scope and breadth of the work Traylor interns perform. They take on a very high level of responsibility in many different work areas and seem to have fun in the process. TBI: Tell us the story of how you came about to create the internship presentation program. Madelyn Pike (MP): Several people had a hand in developing this idea. We wanted to showcase the work our interns do –especially in ways that demonstrate innovative thinking and problem-solving capabilities—as well as highlight their overall internship experience. Scheduling various presenters in different time zones had its challenges, but it brought our interns together for a single afternoon of presentations, allowing them to connect with their peers across the country and learn more about our other projects. Division Management, Intern Supervisors, MA Coney, and Jacob Jones, among others, contributed to our presentation day. TBI: Tell us about your role at Traylor and what specifically you enjoy about it. MP: I wear many hats in HR, but I focus a lot of attention on our University Recruiting and Relations initiatives, including our Intern Program. I love working with students throughout the recruiting, internship, and interview processes, sometimes over the course of several years, to eventually see them come on board as a full-time employee. It’s definitely one of the most fulfilling aspects of my job. MP: I enjoy traveling and a good book. I have a fun, tight-knit family, so I enjoy spending time with them, my husband, and my dog, Penny. I just finished my master’s this spring, so I’m learning what it’s like to have free time for hobbies again! MP: Recruiting at Traylor is such a rewarding area to work in. It’s people-oriented. It’s something new and challenging every day. It’s gratifying to help someone land their dream job, and equally impactful to feel like you’re helping the organization fill critical roles with the right people. I love doing my small part to help build the Traylor team.